An environmentalist’s work is often fighting to keep bad things from happening. It’s like playing defense; defending the coast, the surf spot, the access point, or the entire planet. It is exhausting but it is what we do. Occasionally we score a victory that is not defensive, that will have a positive impact going forward. Such was the case with the New York City bag fee law. It passed last month after two years of hard work by a dozen environmental groups including Surfrider Foundation’s NYC Chapter. With an estimated 9 billion bags used in NYC annually, and with other bag fee laws showing 70% or greater reduction in bag use, this law was going to be a huge positive step. No sooner did it pass than a NY State Senator introduced a bill in Albany to prohibit cities and towns from passing such laws including the NYC law since it had not yet gone into effect. Great, so now we are playing defense defending a law that should have been a major offensive victory for us. Uggghhh. 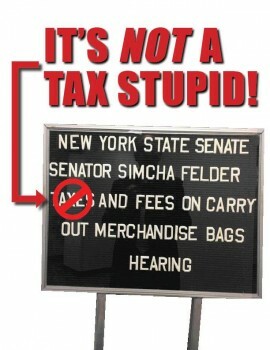 And this NY State Senate bill had legs too. It passed the State Senate Committee on Cities, then the Assembly Committee on Cities, and then it passed in the full State Senate - all in a matter of weeks. Yikes! But the Surfrider troops rallied as did other groups. Through our Action Alert emails, and a massive push for calls to the NY Assembly Speaker, we prevented the bill from being voted on in the full Assembly. All three NY Chapters helped in this effort since bag fee legislation was pending or being considered in both the Central Long Island’s and the Eastern Long Island’s territory in addition to the NYC law. Everyone had a stake in this. We did prevail but the foes of bag fees may regroup next year. But it was a potent reminder that so much of what we do is to make sure nothing happens. The casual observer must wonder what us environmentalists do all day. The casual observer did not see offshore oil rigs and LNG terminals yesterday, and they are not there today either. They don’t see the dozens of people from scores of groups who worked hundreds of hours to organize thousands of others to make sure that these things did not happen. And with bags in NYC, after we fought to make a good positive victory happen, we had to fight like hell to make sure, this time, that nothing happened to that victory.